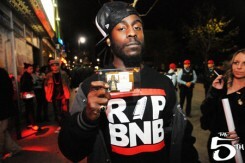 Paul Frappier (May 8, 1977 – February 11, 2011), better known by his stage name Bad News Brown (at times, also as BNBand Briz Brown), was a Montreal-based Canadian entertainer, musician, and hip hop MC of Haitian origin. He was well known for pairing the sound of his chief instrument, the harmonica, with hip-hop beats and rhymes. Frappier started busking in Montreal taking his signature sound as a teenager to the streets and subway stations of Montreal. He later toured and opened for many well-known hip hop acts or as background musician. He also appeared as an impromptu host in Music for a Blue Train, the 2003 documentary about busker musicians in the Montreal Metro subway train system. In 2004, he signed a management deal with E-Stunt Entertainment Group. In 2009, he established his own record label Trilateral Entertainment Inc and released his debut studio albumBorn 2 Sin. He was murdered in Montreal, Canada, and his body was found there on February 12, 2011. The long feature filmBumRush featuring him in a leading role premiered on 1 April 2011.